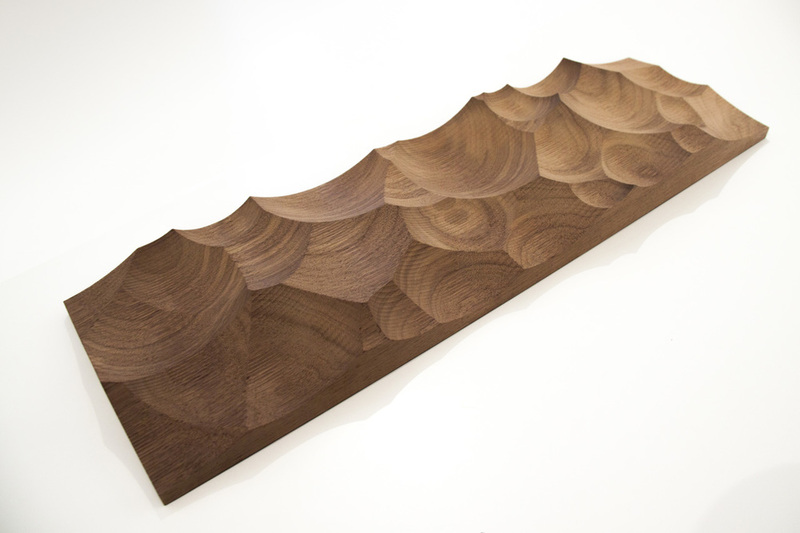 Timber Cloud arises from a deep interest in the evolving role of civic space in contemporary society. The project reaches out to its context via two new pedestrian axes, connecting the Olympia Deck to the city and Tahtitornin Vuori Park to the waterfront via a new elevated bridge. 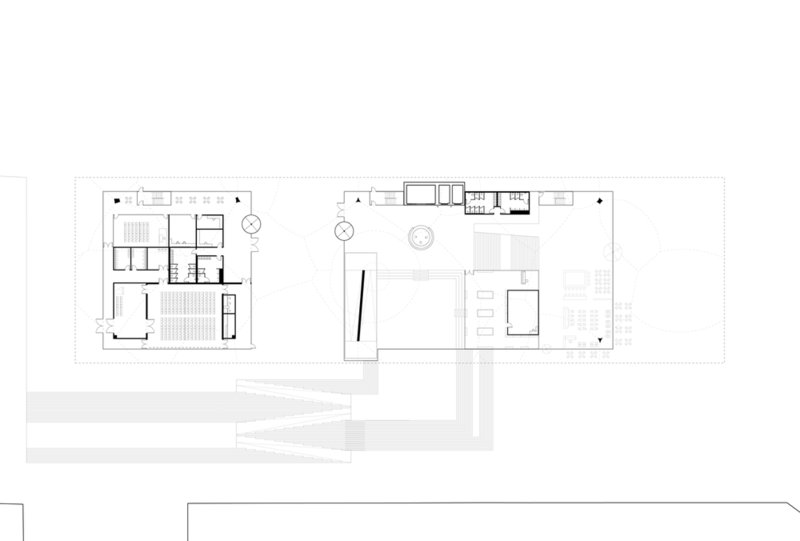 In recognition of the urban significance of this new pedestrian crossroads, and in service of a high degree of curatorial flexibility, the proposal elevates exhibition spaces form the ground plane and locates them within a large, versatile top-lit cloud. 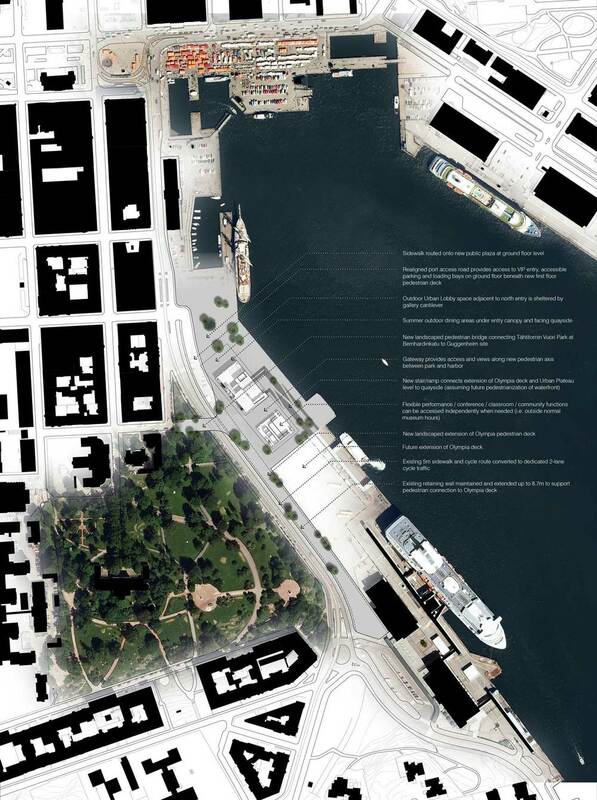 Below, public spaces are organized within a large, vibrant and accessible Civic Plateau, with views toward the city and harbor. Recognizing the role of the dome throughout Western history as a signifier of civic space, we question the contemporaneity of its associations with hierarchy and power. 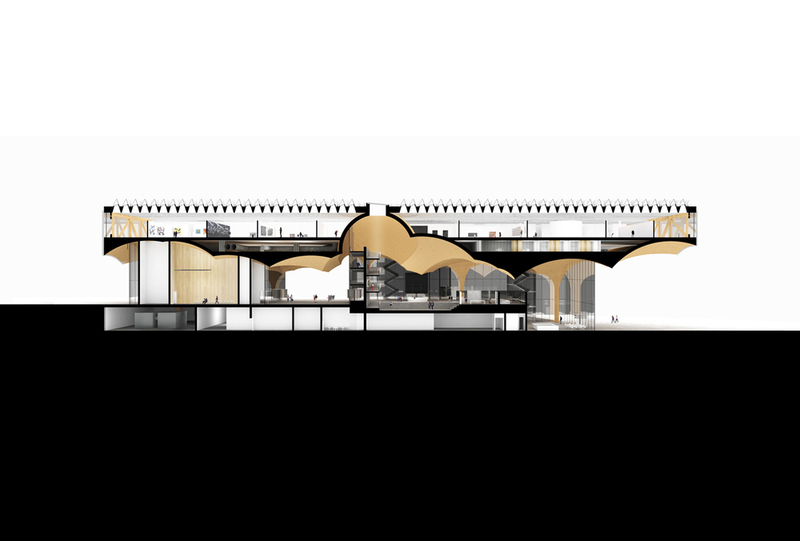 The form of Timber Cloud's exuberant lower ceiling replaces the static, centralized dome of the historical museum paradigm with a multiplicity of fragmented hemispheres, yielding an interior that is dynamic, decentralized, spatially diverse, and emblematic of the vibrant heterogeneity of the contemporary democratic city. Timber Cloud supports a very high degree of curatorial flexibility. All dedicated exhibition space is located on a single column-free upper floor, with support functions along the western edge. 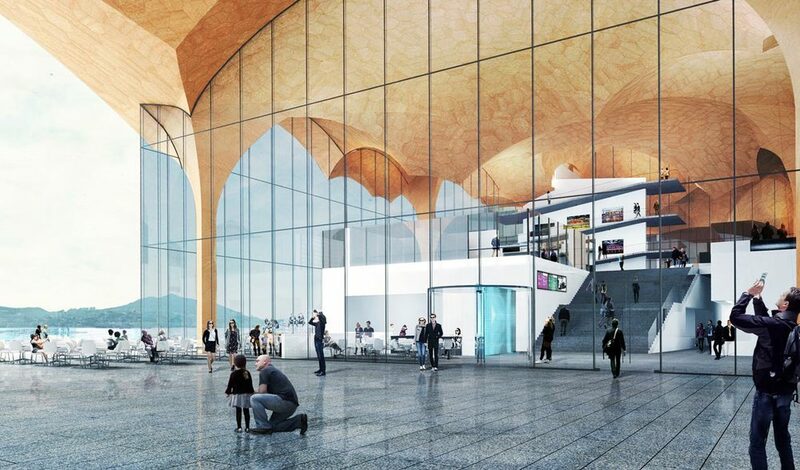 Toward the harbor, a screened glass skin allows views and filtered light, amenities that can be incorporated into shows or divided by partial height walls to be used as lounge spaces based upon curatorial discretion. In addition to stairs and passenger elevators, visitors ascend via two ceremonial routes: the ramp of the Art Spiral or the Movable Room, a 30-square-meter glass elevator for visitors and freight. 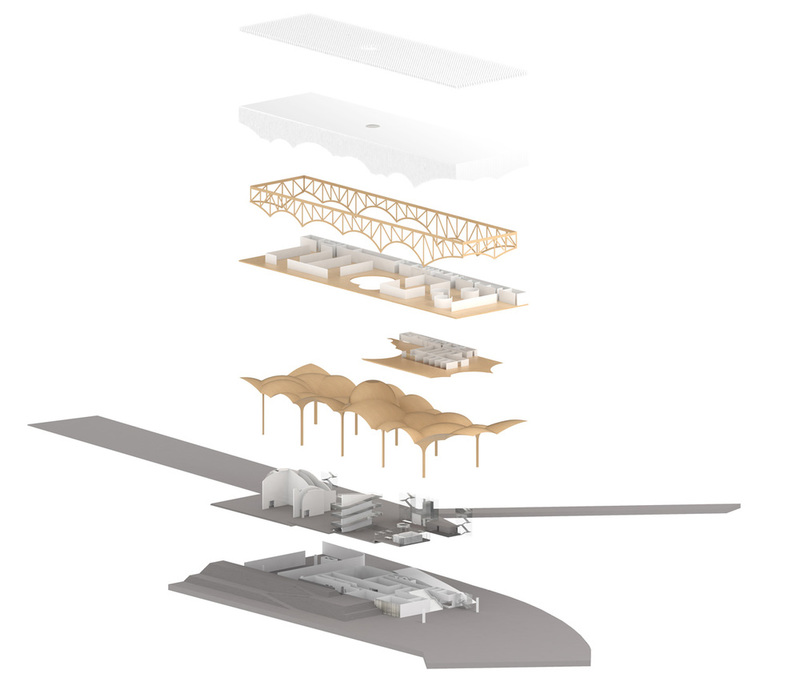 Our proposal utilizes contemporary technology to promote the innovative use of wood, a renewable, carbon-storing and locally abundant material. 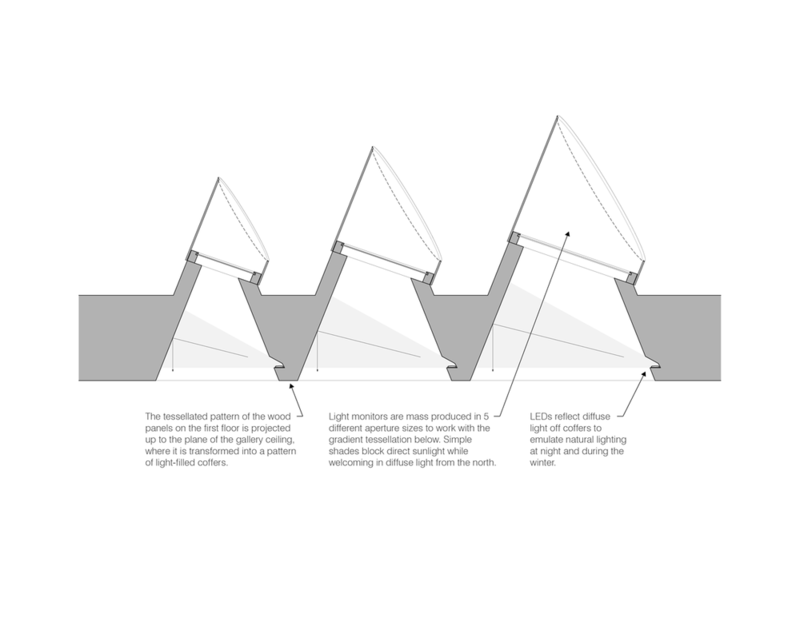 The curved surfaces above the Civic Plateau are parametrically subdivided for digital fabrication, with sheet optimization and waste reduction a perennial objective. Above, in the ceiling of the exhibition floor, the pattern of the wood panels reappears, but with a different environmental agenda. Here, the tessellation is materialized in-plane as a series of white gypsum coffers, each with a north-facing light monitor above. The varying angles of the 3D panels below translate into zones of varied density upon this new projection plane above, perceptually transforming the flat coffered ceiling plane into rolling waves of daylight. Embedded LEDs continue the diffuse lighting condition at night and through the short winter days. 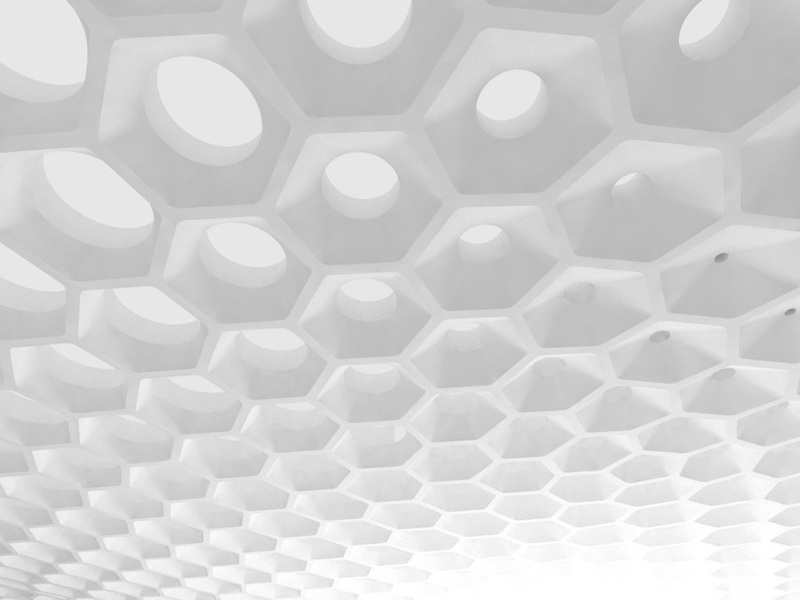 The line drawing of these panelized hemispheres is projected onto the ceiling of the galleries above, where it is realized as a pattern of tessellated coffers admitting indirect natural light into the space. The varying angles of the 3D panels below translate into zones of varied density upon this new projection plane above, perceptually transforming the flat coffered ceiling plane into rolling waves of daylight. The vast spaces of Timber Cloud are spanned by two deep trusses, reminiscent of timber bridges in their capacity to utilize both curvature and triangulation in the achievement of their spans. Again stemming from an interest in the sustainable properties of wood, we seek to demonstrate the technological potential of contemporary engineered wood products together with custom FEA steel connections as a high-performance hybrid. While addition building systems reduce energy consumption, the primary environmental strengths of this proposal are embedded within its diagram. By offering a synthetic solution for a series of concerns - form, organization, communication, structure, materiality, light and views - Timber Cloud achieves its sustainability objectives with a light hand, once again returning attention to the most important aspect of its program: human experience.